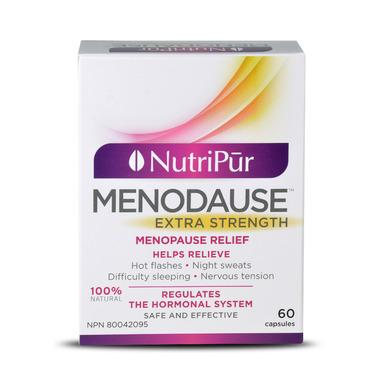 Menodause is a complete and all natural formula made with essential nutrients beneficial for the relief of unwanted symptoms of menopause and perimenopause. It helps in restoring hormonal balance, increasing energy and well-being. Menodause helps to relieve the following uncomfortable symptoms of menopause and perimenopause: premenstrual syndrome, hot flashes, night sweats, anguish, anxiety, fatigue or lack of vitality, insomnia, irritability, mood swings, easily depressed, nervousness, palpitations and weight gain associated with menopause. Recommended Dose: (During menopause): Take 1 to 2 capsules twice daily. Contraindication: Do use if you are pregnancy. Cautions: Consult a health care practitioner prior to use if you are breastfeeding, if symptoms persist or worsen, if you have a liver disorder or develop symptoms of liver trouble or if you are taking hormone-containing medications such as progesterone preparations, oral contraceptives or hormone replacement therapy. All Nutripur products are manufactured in a manner that exceeds industry standards and are rigorously tested in accredited laboratories for toxic contaminants and heavy metals assuring the safety, purity, efficacy and high-quality of their products. I am finding this product to be helpful in reducing hot flashes. Coupled with exercising and eating right is good. My gp advised me that this is the perfect way to start this "treatment". I have now finished half the box and it has totally eliminated my hot flashes and night sweats. Will buy another box. Happy to find a natural product that works so effectively. I've purchased this product for my now menopaused wife and it works a little better than other similar products. We'll keep using it. I have been taking this for some time,and truly helps.stops nervous tension ,no hot flashes.A must for me to stay on it. These do help more than others I have tried but I think I'll ask my doctor to prescribe HRT - the lower dosage of HRT work like a charm. This is the one product out of everything I have tried so far (and it has been a LOT) that has helped my menopause 'fog brain', hot flashes & some insomnia.